9 Piece Kids Cutlery Set will make it ease for your child to learn how to use eating utensils and exciting to have silverware like adults that are their size and safe. Specially Designed for Children's Size and Safety. This set of kid's flatware will last for years; your child will outgrow it before it begins to show signs of wear and tear! Set Includes 3 Knives, 3 Forks, 3 Spoons, Total of 3 Place Settings. 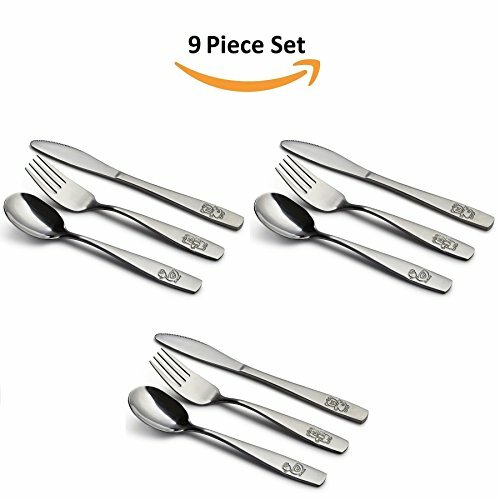 9 Piece - Stainless Steel Kids Cutlery, Set Includes 3 Knives, 3 Forks, 3 Spoons, Total of 3 Place Settings. The Perfect Gift for New Parents, Baby Showers, Baby's 1st Birthday, Easter, Christmas or any Event. Kids Will Be Excited to Have Silverware Like Adults but That Are Their Size and Safe. Specially Designed for Children's Size and Safety, Fork with Rounded Fork Tines and Knife with Non-Serrated Blade. Perfect Set for All Meals. 3 Forks, 3 Spoons, and 3 Knife. No Need to Keep Washing Dishes All Day. Fork Size: 5.75in x 1in, Spoon Size: 5.75in x 1.25in, Knife Size: 6.5in x .8in. Made with the Highest Quality, Stainless Steel #430 (18/0). Will Not Scratch, Break, Chip, Rust or Dent. Free of ANY Hazardous Materials. Dishwasher Safe. Fun Engraved Design for all Ages and Genders: Juniors, Toddlers, Preschoolers, School Age Children. Utensils that make Mealtime Exciting and Safe. If you have any questions about this product by GlossyEnd, contact us by completing and submitting the form below. If you are looking for a specif part number, please include it with your message.